My daughter and I share a bathroom and it’s not very big. But she has curly hair and I have wavy hair. So we typically have at least 2 types of shampoos and 2 types of conditioners in our bathroom if not more. With Peyton’s hair being so curly and having a sensitive scalp I typically shampoo and conditioner her hair every other or third day but find myself refreshing her hair in between. I typically shampoo and condition my hair on a daily basis but lately I’ve noticed my scalp is dry. The combination of cold temps and forced dry hot air is really taking a toll on my hair. LuxeOrangix is unlike any other hair care product I’ve used. First, it smells amazing! I love the refreshing mint fragrance. Even my daughter thought my hair smelled wonderful hours after I had washed it. Second, this is not a shampoo. It’s a cleansing conditioner. When I squeezed a little out of the bottle (and yes you will have to squeeze this is a nice thick and creamy product) I was impressed with how thick it was. And the minty smell helped me feel energized and awake, which I greatly needed. It was also nice to be in and out of the shower quickly. With only having to use the cleansing conditioner on my hair I saved a few minutes. I simply slathered it on my hair, washed my body with my body soap and then rinsed. I was done. In and out in a matter of 10 minutes or less. I am always looking for time saving products to make my mornings go smoother. With my wavy hair I have to be careful what I use. Chemicals and fillers in hair care products can easily make my hair look dull and frizzy. 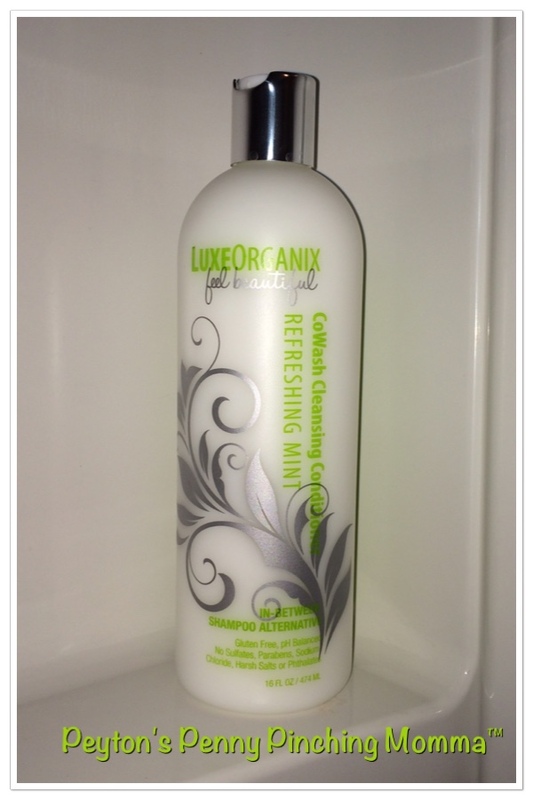 The LuxeOrganix is gluten free and contains no sulfates, parabens, sodium chloride, harsh salts or phthalates. All that translates into soft, beautiful, bouncy and wavy hair. I love how my hair felt after it dried. I let it air dry and it looked full of body and had plenty of bounce. I really enjoyed using LuxeOrganix and I loved how my hair felt after using it. I also appreciated the little pick me up wake me up I get when I inhale the mint fragrance. Keep on reading for your chance to enter and win your very own bottle of LuxeOrganix. Refresh your hair and liberate it from the daily grind of everyday shampooing, while igniting your senses with this gentle, luxurious Refreshing Mint #CoWash Cleansing Conditioner. Enhanced with natural essential oils and botanicals that won’t strip your hair, color or scalp. Designed to protect and preserve your hair’s natural oils, while still gently cleansing and providing your hair with enhanced moisture. Hair styling becomes easier with this premium cowashing treatment. Woman Owned Company, Made in the USA with the highest quality ingredients. Disclaimer: Open to the USA ONLY. Networking Perks provides honest opinions, beliefs or experiences on products reviewed. Networking Perks will not be held liable for prize handling and algorithm generation associated with this contest. The bloggers participating in this event were no way compensated, however they did receive the product in exchange for an honest review. This event is in no way associated with, sponsored, administered, or endorsed by Twitter, Google, Pinterest, Facebook or any other social media. If you have any questions or would like help in promoting your own product please contact me at Karie@TheFiveFish.com. The disclosure is done in accordance with the Federal Trade Commission 10 CFR, Part 255 Guides concerning the use of Endorsements and Testimonials in Advertising.